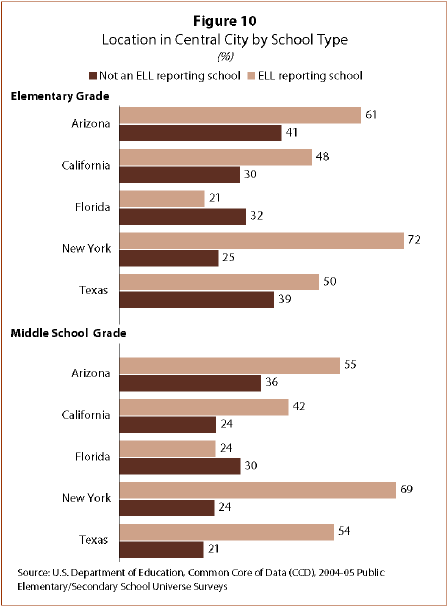 With the exception of Florida, ELL reporting schools were much more likely to be in central cities than in suburban or rural areas (Figure 10). For example, in New York about seven-in-ten ELL reporting schools were central city schools. In comparison, only about one-in-four New York schools that had few ELL test-takers were located in the central city. Generally, students in central city schools have lower mathematics standardized test scores than students in schools in other geographic areas (NCES, 2005). ELL reporting schools had higher student enrollments (Figure 11). This is particularly true for ELL reporting middle schools, which were much larger than middle schools that had few ELL test-takers and that therefore did not report ELL student test scores. 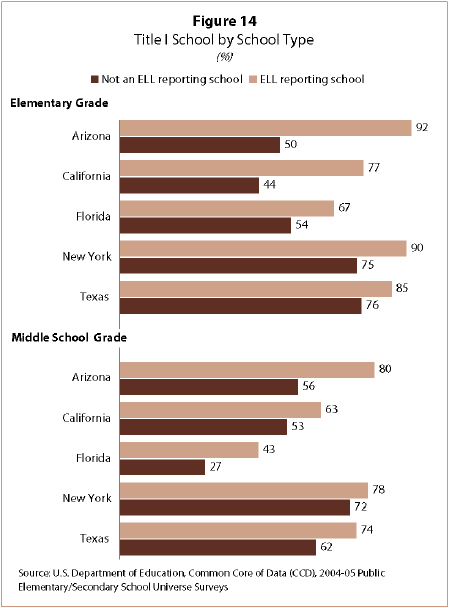 For example, in Texas the typical ELL reporting middle school enrolled 858 students. 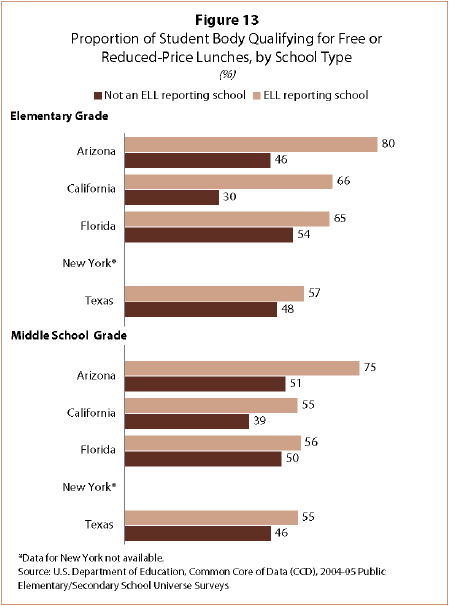 Texas middle schools with insufficient ELL test-takers to report ELL test results had 342 students enrolled. In California, a similar pattern is present. The average middle school in California that reported ELL test scores had a total student enrollment of 999 students. The average California middle school that did not report ELL achievement results had only 390 students enrolled. Student-to-teacher ratios, a crude measure of instructional resources, are positively associated with school size (NCES, 2007c) and, indeed, ELL reporting schools in the five states tend to have higher student-to-teacher ratios (Figure 12). Again, the difference in this characteristic is largest for middle schools. 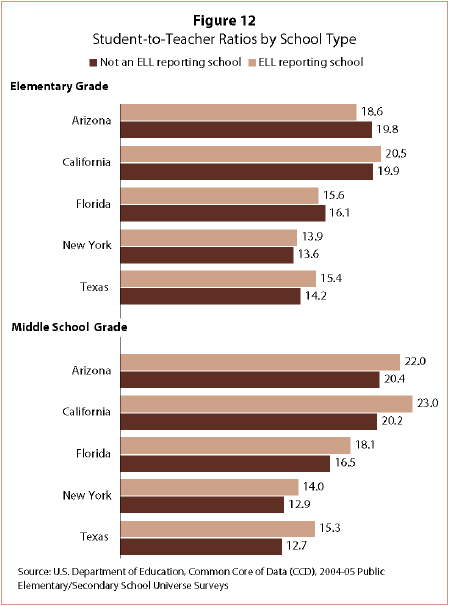 For example, the average ELL reporting middle school in California and Texas has about three more students per full-time equivalent teacher than middle schools with few ELL test-takers. Two measures suggest that schools that report ELL student assessment test scores were more likely to be “high-poverty” schools, or those in which a greater proportion of the students were from economically disadvantaged families. The percentage of students qualifying for free or reduced-price lunches is a proxy for the share of students living in or near poverty. On average, a majority of the students at ELL reporting schools in the five large ELL states qualified for free or reduced-price lunches. And those students were more likely to qualify for free or reduced-price lunches than students in schools with few ELL test-takers (Figure 13). The NAEP shows that student mathematics achievement is negatively associated with the percentage of students in the school eligible for free or reduced-price lunches (NCES, 2005). Furthermore, ELL reporting schools were significantly more likely to be designated Title I schools (Figure 14).12 Title I schools are not necessarily low-achieving schools. However, they are high-poverty schools, and “achievement levels in schools where children from low-income families are concentrated are on average lower than in schools where most children are from families with higher incomes” (Kosters and Mast, 2003). Finally, ELL reporting schools tend to have had a much lower proportion of white students attending them compared with schools that do not report the assessment test scores of ELL students because they have few ELL students. In the five large ELL states, ELL reporting schools had about a quarter to a third white enrollment (Appendix B Tables B3 and B4). 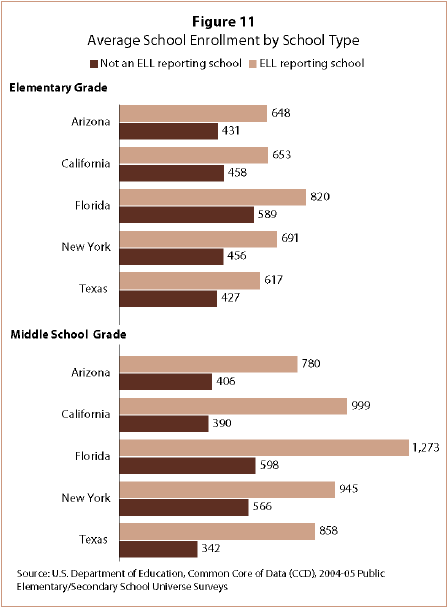 In contrast, schools with few ELL test-takers were on average majority-white schools.